It is a fairground ride that is rotation in the air. The cute color and appearance meet the requirment of the consumers. The device rotates, taking passengers hanging chair as if flying in the sky, experience the excitement of harvest and happiness. The cute appearance and cartoon image make it become popular among kids. 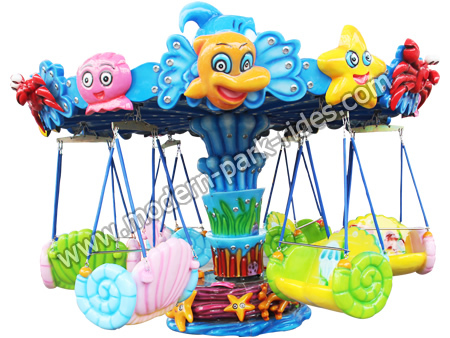 This fairground ride is a variation on the carousel in which the chairs are suspended on the chairs from the rotating top of the carousel. This type of swing ride can always attracts a lot of people.